Our world exists and develops because of God and his Son Jesus Christ. History, that is His story, is all about Him and his plan of salvation for mankind, his image bearers. The past, present, and future is not about Israel or the Jewish nation, but about Christ. Jesus in his post resurrection pre-ascension spoke these words to his disciples (one of the last things that Dr. Luke records in his gospel): “Then he said to them, ‘These are my words that I spoke to you while I was still with you, that everything written about me in the Law of Moses and the Prophets and the Psalms must be fulfilled.’ Then he opened their minds to understand the Scriptures, and said to them, ‘Thus it is written, that the Christ should suffer and on the third day rise from the dead, and that repentance and forgiveness of sins should be proclaimed in his name to all nations, beginning from Jerusalem.’ “ (Luke 24:44-47, ESV) The scriptures of the Old Testament are about Christ, and we, who live after the cross, have the privilege to see things not in shadow and types, but in their fulfillment and to understand clearly the plan of salvation that God has ordained before the foundation of the world, and perfectly executed through his Son, the Lord Jesus Christ. We are truly blessed to live after the end of God’s progressive and written revelation. The apostles’ message was all about Christ. Though they hardly recuperated from the shock that their Messiah did not set up a physical kingdom on earth and was humiliated by the worse kind of death, yet they immediately preached and proclaimed him. Yes, they had the privilege of seeing their resurrected Lord and being instructed by him, but nevertheless, they must have been in a state of shock for some time. Yet their message clearly was Christ-centered as we read in Acts 5:42: “And every day, in the temple and from house to house, they did not cease teaching and preaching Jesus as the Christ.” The truth had set them free, and there was nothing more important than to teach and preach that Jesus is the Christ, the promised Messiah of Israel. I hope that we also would have such a zeal and desire to passionately proclaim Christ to the world. In Philippians 3 after giving us a short biography of himself and some of his “accomplishments” he wrote in verse 8: “Indeed, I count everything as loss because of the surpassing worth of knowing Christ Jesus my Lord. For his sake I have suffered the loss of all things and count them as rubbish, in order that I may gain Christ” – compared to Christ, he considered all other things as rubbish and even worse. As we see it is all about Christ and his work. The Old Testament, the establishment of the church in the apostolic age and message of Paul, are all about Christ. It is not about anything else, and we also should not allow anything to blur the message of the Gospel, not even Israel. Only after setting Christ in his right place we can look at the place of Israel in the past, present, and future. You see, it is only when we put God in the right place that everything else can fall in its right place. It would not be an exaggeration if I will say, that most of the Christians will acknowledge the place and the role of Israel in the history of the church. God’s call of Abraham out of the land of Haran to the land that He would show him started in many ways the story of the Jews, the wandering Jew as often we are called. God not only calls Abraham, but makes promises to him, and cuts a covenant with him as well. In that covenant, accordingly to the custom of those days at the Ancient Near East, Abraham cuts animals in halves, but unlike most covenants, only one party walks between the cut animals. The custom was that both parties would walk between the cut animals, and would say “may it be to me as to these animals if I do not keep my part of the covenant.” But in Genesis 15, only one party walks between the cut animals and it was not Abraham! God’s promise was not only of a Land, but that he will make Abraham a great nation, and bless him and make his name great. Furthermore, he also promised him that he would bless those who bless him and dishonor those who dishonor him (Gen. 12:1-3). Though Abraham did not have the patience to wait for God to fulfill his promise to him through his own body and seed, God miraculously gave him and Sara a son Isaac. Isaac had two sons, but the younger, Jacob, was appointed as the heir, rather than the older, Esau. As in the case of Isaac, this too was to show the sovereignty of God, and that He is above all men’s customs and cultures. The twelve sons of Jacob became the twelve tribes that eventually end up in Egypt through unusual circumstances. In Egypt, they turned from princes to slaves. But God with a strong hand and an outstretched arm through many miracles brought Israel out of slavery, set them free and called them his people. The feast of Passover, which was celebrated not a long ago, is a clear reminder of God’s compassion and his amazing deliverance. It was to these people that God gave his law, his word and dwelt among them in the tabernacle, and later in the temple. He was their God and they were his people, even though too often disobedient to him. To them, he gave his covenant blessings, though they were not covenant-keepers, rather covenant breakers! Also after the establishment of the Kingdom of Israel, including the northern and the southern kingdom, God’s people were disobedient to him. We did not give heed to his warnings spoken through his prophets, declaring the coming judgment. Finally, God’s judgment came, as he sent both the northern and later the southern kingdom into exile. That was the darkest period of the history of the people of Israel till that point. They were humiliated, exiled, their cities were conquered, and Jerusalem and the temple destroyed. Yet God through his faithfulness and according to his promises brought them back from exile and allowed them to rebuild their cities and the temple. In all their rebellion and sin, God was faithful to his people, even though they went after idols and followed the gods of other nations. Yet it is amazing to see in the Old Testament God’s grace and mercy, as he deals with his rebellious people. Time after time God in his grace would not destroy the people and would not give them what they deserve, but, as a father, gently and lovingly would discipline them. When they would cry out, he graciously forgave them. He heard their cries, even though they were in complete rebellion against Him. 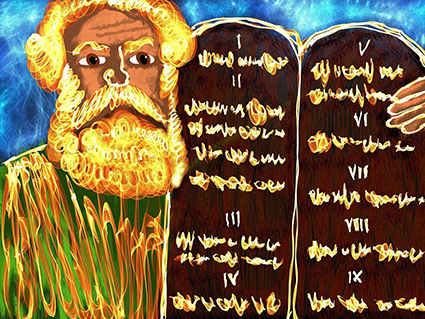 The Old Testament is a great source of evidence for God’s grace and faithfulness, yet also of his Law and judgments. But of course, His grace and faithfulness are seen ultimately in the fact that Christ was given to that same rebellious, idolatrous nation. According to prophecy and at the exact time Jesus was born to Mary and her husband Joseph of the tribe of Judah. When Jacob blessed his sons before his death, in Genesis 49:10 he blessed Judah with the words: “The scepter shall not depart from Judah, nor the ruler’s staff from between his feet, until tribute comes to him; and to him shall be the obedience of the peoples.” Jesus was from the tribe of Judah, and he is the king that is ruling now and forever, according to the words of Jacob to Judah. Despite Israel’s rejection of God’s ways and his commands, God faithfully executes his plan of salvation for the world through Jesus, the Jewish Messiah. He came to his own; he came first and foremost to the Jewish nation. This is about the grace of God and his faithfulness to his promises. It is a wonderful example for us even today, so we know that it is not about us, but about God and His faithfulness. The people rejected their God, they whored after other gods, they acted unjustly to others and to one another, they trampled his holy commandments and desecrated his temple, yet God sent them the savior. He came from them and to them first and foremost, but not only. Paul talked about the Gospel as the power of salvation to everyone who believes, to the Jew first and then to the Greek (Rom. 1:16). God indeed gave to the Jewish people a special place in his redemptive historical plan for the salvation of the world. Our New Testament begins with the words: “The book of the genealogy of Jesus Christ, the son of David, the son of Abraham.” Christ is there right between the two giants, the two pillars of the Old Testament, Abraham, and David. So we can see the role of the Jewish people in the past, yet there is also a present and a future. When we speak about the importance of Jewish people and the Israelites, often we recognize the role that they had in the past, but we stop there. And I believe that we need to take a step further, because of the biblical demand – as I understand it. First of all, I want to emphasise that a Jew person, as such, has no special favor when it comes to salvation. John the Baptist, the forerunner of Christ, said in Matthew 3:9: “And do not presume to say to yourselves, ‘We have Abraham as our father,’ for I tell you, God is able from these stones to raise up children for Abraham.” We, as Jewish people, have no merits, when it comes to salvation. There is only one Way, one Truth and one Life for all, and that includes the Jews. Jews are saved in the same way as any other person – through faith in the atoning blood of Christ. We are justified because of his active and passive obedience and his righteousness being imputed to us. It is all by grace and his grace alone. Paul clearly states it in plain words in Ephesians 2:8-9: “For by grace you have been saved through faith. And this is not your own doing; it is the gift of God, not a result of works, so that no one may boast.“ The reformers in the Sola Gratia, which is one of the five Solas of the reformation (this year is the 500 anniversary of the reformation), reaffirmed that same simple truth that salvation is by grace alone. It is not by works and certainly not by heritage or ethnicity. However, though we are one in Christ and saved only by his work, our identity in Christ does not disappear but remains. When you came to faith, you don’t lose your identity culturally and language wise, and in other respects as such. Yes, you received a higher and more important identity in Christ, but your national identity remains. A male person remains male when he comes to Christ, just as a female remains such. In the same way, a Jewish person does not lose his identity when he comes to faith in the promised Messiah. We remain Jewish while embracing our Messiah. In the present days, and especially in the last couple of years, we see a great openness to the gospel among the Jewish people. We see young Israelis coming to faith in Messiah. We see that the Media is more open towards Jewish Christians. Many of them serve in the military with a great zeal and desire to share Jesus with others. In the goodness of God, we are experiencing a new tide in the land, one that is very encouraging. Paul in his letter to the Roman church tells us passionately about his heart’s desire for his kinsmen, the Israelites. So much that he was willing to be cut off from the inheritance that he had in Christ if only they would come to acknowledge Christ. Moses was in a similar situation when people grievously sinned against God. He was willing to be a blot of God’s book if God would not forgive their sins. Exodus 32:31-34: “So Moses returned to the LORD and said, ‘Alas, this people have sinned a great sin. They have made for themselves gods of gold. But now, if you will forgive their sin – but if not, please blot me out of your book that you have written.’ But the LORD said to Moses, ‘Whoever has sinned against me, I will blot out of my book. But now go, lead the people to the place about which I have spoken to you; behold, my angel shall go before you. Nevertheless, in the day when I visit, I will visit their sin upon them.’ “ Both Moses and Paul had a great desire for the salvation of their people, so much that they were willing to give up on their eternity for the sake of their kinsmen. Ultimately, Christ was the one to receive the full judgment of God on behalf of his people. He alone was the true Passover lamb sacrifice, who took upon himself the sins of his people. Moses and Paul were willing, but Christ accomplished. Paul recognized that God’s plan for the salvation of Israel has not ended – many will yet come. Romans 11 helps us greatly in understanding the position and the role of Israel today and in the future. Paul asks: “has God rejected his people?” and his answer is: “by no means!” Actually, the Greek word for “by no means” is ge,noito from the root of gi,nomai that means “to become” or” to be” with the negative, so it can be read “it cannot be.” After that, he approves the statement by his own example first – being a Jew and follower of the Messiah, and then he gives the example of Elijah, who thought that he was the only one left, but God has kept for himself seven thousand men, who did not bow a knee to Baal. There always has been a remnant among the Jewish people. But more than that, Paul tells us that through their trespass and rejection, salvation has come to the Gentiles in order to make Israel Jealous (11:11). The rejection of Messiah by the Israelites should not come as a surprise to us in light of the reality of the Old Testament. More than that, try to imagine what would have happened, humanly speaking, if the Jewish people would have embraced Jesus as their Messiah? Most likely many of us would stay in the darkness because the gospel would have remained secluded mainly to the Jewish people in the Jerusalem area. So in a sense, we need to be grateful for the fact that they did reject Christ, because, as a result, richness has come to the Gentiles. Finally, Paul argues that if their rejection meant richness to the gentiles, how much more their acceptance, or ‘full inclusion’ -using Paul words (11:12) will mean to the gentiles. He brings his argument to a full conclusion by saying that it is more natural for the original branches to be grafted in, than for the wild olive shoot to be grafted in. For Paul, the hardening is partial, until the fullness of Gentiles comes in, and then all Israel will be saved. Paul does not see an end for his kinsmen, the Jewish people, but rather a great hope as all Israel would be saved. Of course, all does not mean every single person, but nevertheless, a large number of the Jews would come to faith. Do the Jews have a role in the future? The answer that Scriptures give is empathically YES. God is not finished with his people of Old. They will yet be brought to bow the knee before their promised Messiah. A revival and renewal are promised to happen among the Jewish people. And we are starting to see its first fruits in Israel, as more and more are coming to faith! The salvation of the Jews has a great ramification not only for them but for the church at large. It gives the hope to the church, that God will never reject them, but will bring them safely into His presence. For this reason, Jewish mission is important and has a priority in the Scriptures. This entry was posted in Jewish Believers, Jewish Evangelism, Theology, Written Materials. Bookmark the permalink.